The Gray Wolf Locket keychain has the picture of a snarling Wolf encased in metal and covered with glass on the front. 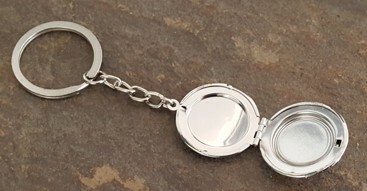 You can open it up and it's a locket that can hold to pictures or a lock of fur or hair, your choice. Makes a neat little Wolf gift or stocking stuffer.